…about your politics or theology. They don’t know if you are fat or having a bad hair day or if your clothes don’t match. You can talk nonsense and they won’t get bored or irritated. 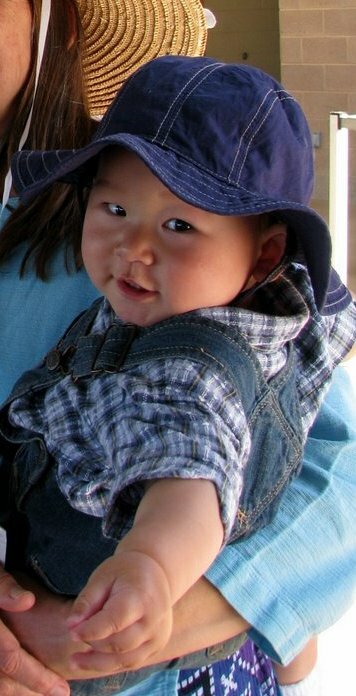 Little Liam is a proper baby and is fun to be with — no social stress. He doesn’t think I’m weird — come to think of it, he doesn’t think about me at all in the way we adults do, though he is taking me in. 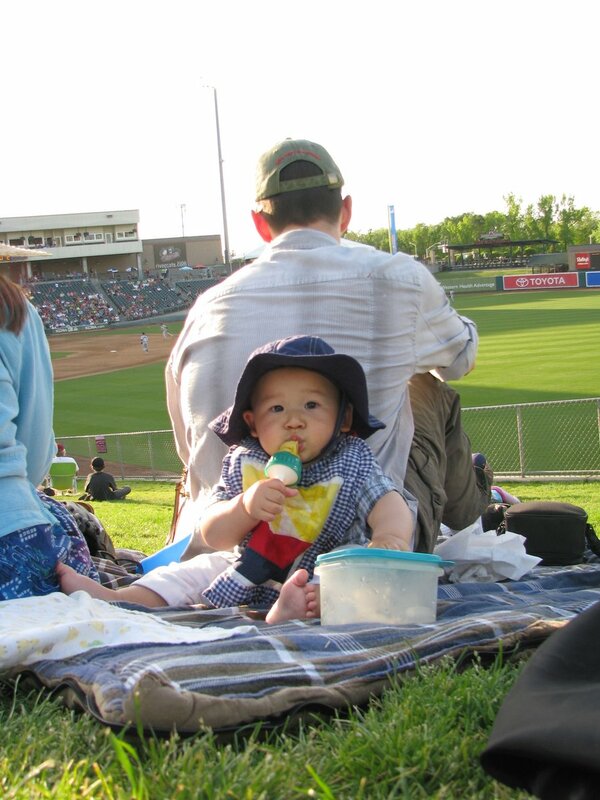 A Triple-A baseball game was the place where Liam and I had a good time on Sunday. 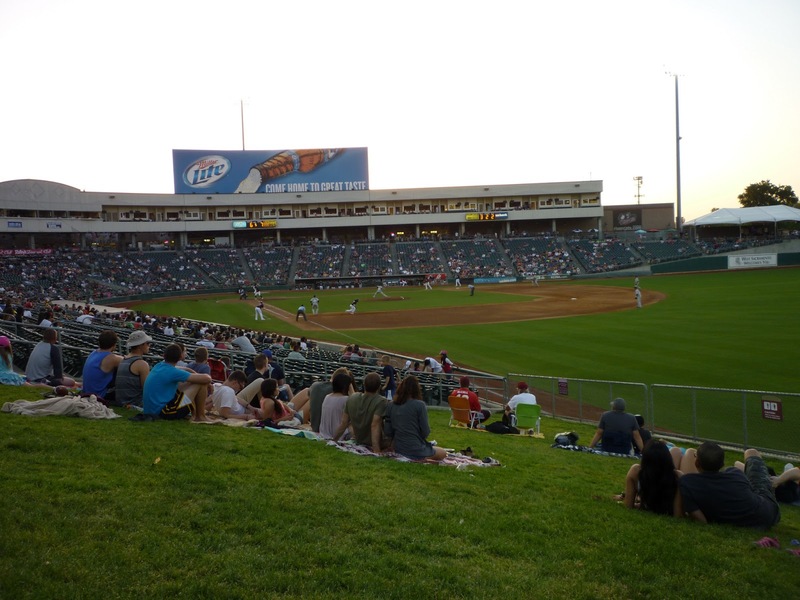 We Glads drove to Sacramento for an evening River Cats game — they were playing the Reno Aces — and sat with Soldier and Joy and the boy on a fairly steep grassy slope overlooking the outfield. It was green all around, and very warm. Baseball feels right when the air is summery. Compared to San Francisco Giants ball games — the ones I’ve been to most often — it was quiet and laid-back and uncrowded (and the opposite of foggy-by-the-bay). So relaxing. Liam didn’t care that our team lost. 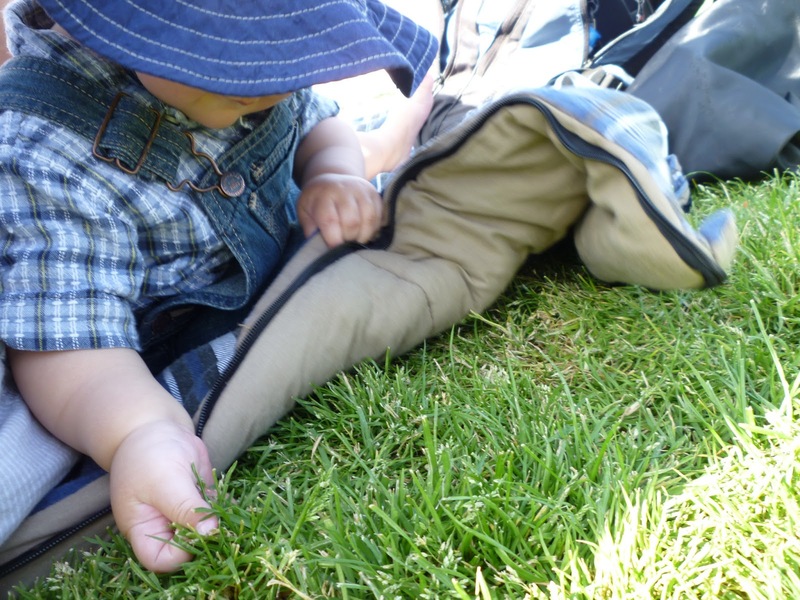 He was busy checking out the grass under the quilt his mama had spread out, and doing crawling experiments: how to maneuver uphill or down without doing sudden somersaults or rolls. Eventually he had a snack of mango, using his father for a backrest. And after that my youngest grandson had become used to me again and didn’t mind a bit when I pulled him on to my lap for a session of clapping and finger games. Soon we were laughing and shrieking and talking plenty of nonsense together. It did this gramma good.